On Saturday the 26th of May the West Australian Young Achiever Awards Gala Presentation Night 2018 was held at the Pan Pacific Perth. Over 450 guests and nominees attended the event which recognises those extraordinary young people in the WA community across a broad variety of fields. 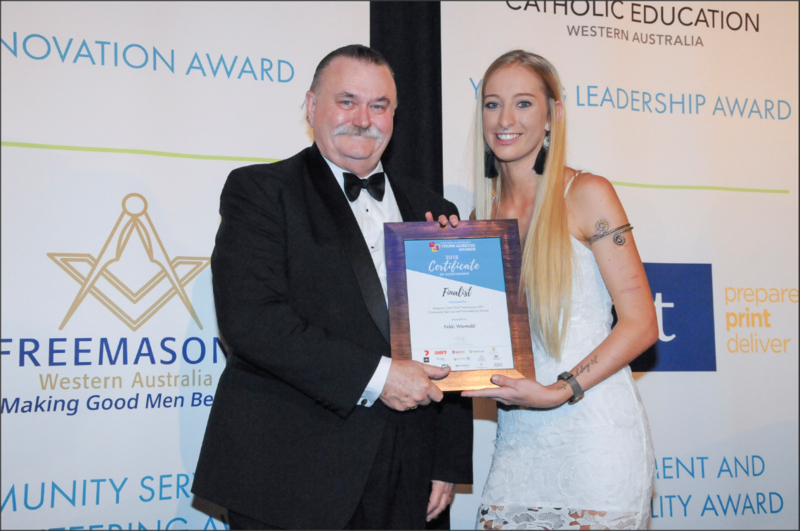 MCWA and FWA are proud sponsors of the Freemasons WA Community Service and Volunteering award which recieved over 50 nominations of exceptional young people working to benefit and give back to communities throughout the state. Nikki Wormald, 21 of Silversands founded a Friday Night Girl’s Program for her local Police-Citizens Youth Club. She project manages a basketball program for at-risk youths and raised $14,000 for the program through grants and fundraising. Nikki sourced government funding to train and source referee jobs for program participants. She simultaneously studied social work and worked for a youth drop-in centre. Working for Mission Australia, she started her own recreational program for homeless young people. Krista Dunstan, 27 of Bayswater has advocated as a lawyer for Indigenous people at the UN. She lectures at the Constitutional Centre on several issues. She spoke at the Australian Law Students Association Conference and convened the National Indigenous Legal Conference. Krista volunteers for the Women in the Law Mentoring Scheme. She is a Legal Practitioner of the Year, features in the WA Women’s Hall of Fame and in the 100 Women of Influence lists. Scott Guerini, 11 of Alkimos started Scott’s Great Walk at age four, walking 25km to town from his farm. He has completed three marathons and hiked 82km in the Canadian Rockies, raising $100,000 for Telethon. He seeks to help sick children and aspires to be a doctor. Scott has featured on Television and delivered a Telethon Beneficiaries Speech to 500 people, including Prime Minister Turnbull. He received the Premiers Australia Day Active Citizenship Award twice. With great pleasure Freemasons WA Grand Master, MW Bro Dr William Babe presented the overal winner for WA, Nikki Wormald with her award on the evening. All our supporters and extended networks wish to take this opportunity to congratulate Nikki on her amazing work and on her recognition as a Young Achiever of the Year. Her dedication and passion for the community are an inspiration!